People stay up all night and offer voluntary prayers (Nafl) and do constant dhikr; asking Allah (SWT) to forgive any sins they might have committed in the past. Different countries have different ways of celebrating this day; each having a different name for it. In Iran, it is called Nim Sha’ban. 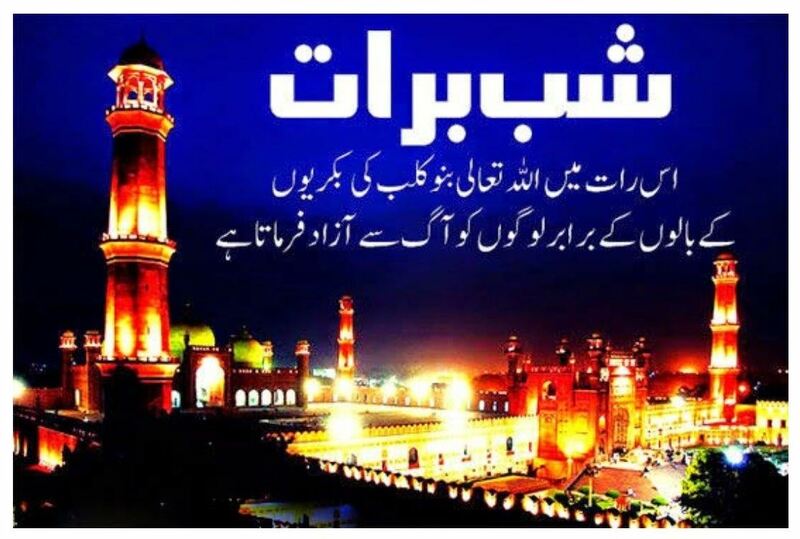 For instance, In South Asia, it is known as Shab e Barat. It is referred to as Nisfy Sya’ban in Malay speaking countries whereas in Turkey it is known as Berat Kandili. People often tend to distribute sweets to each other on this night. Some people even celebrate the night with fireworks although this is a result of the influence of the local traditions and does not have any religious significance. In Iraq, people often distribute sweets to children. In South Asian countries, people usually distribute a local dessert known as a Halwa or other delicacies to neighbors, family, friends, and the poor and needy. Middle Eastern countries normally do not celebrate the night. Sunni Muslims believe it to be the night when Allah (SWT) saved Prophet Nuh (AS) and his ark from the flood. On the other hand, Shia Muslims believe it to be the day when the 12th Shia Imam, Muhammad al-Mahdi, was born. There are no Ahadith or verses in the Quran that clearly point out or talk about the significance of the night. 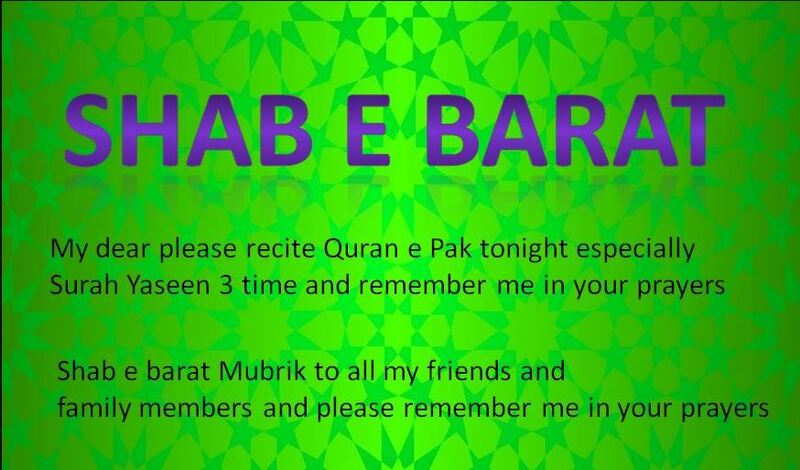 However, especially in South Asia, many people celebrate the night, spending time in worship of Allah (SWT).
. Shab e Barat is celebrated (enjoyed) in mid of Shaban, on the night in between the 14th and 15th of Shaban. 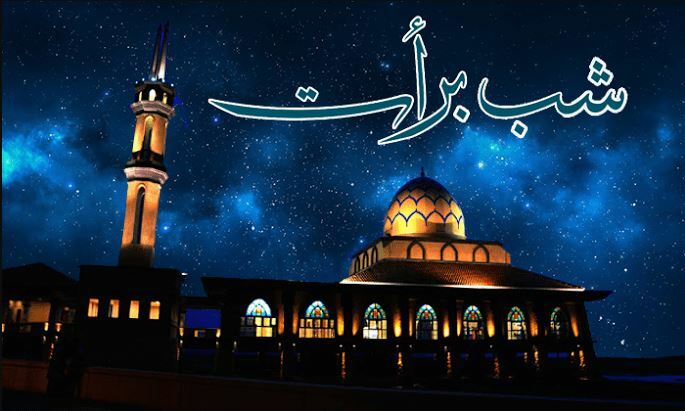 Shab-e-Barat, also known as night of forgiveness is observed every year on the night between the 14 and 15 of Shaban, it is the night when Allah Subhanahu wa ta’ala forgives the sins of everyone, and decides destinies for the coming years. 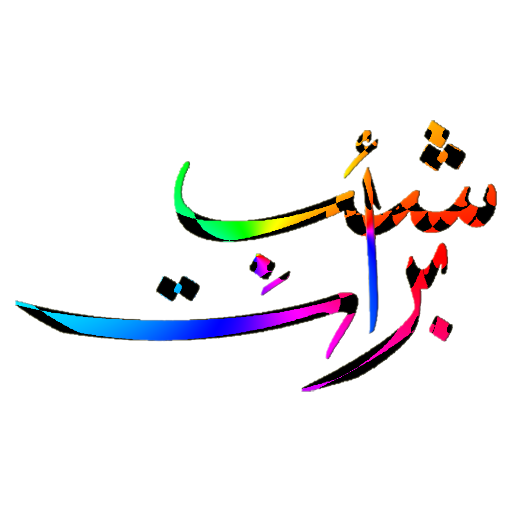 This night is also called Bara’a Night, Mid-Sha’ban and Laylat al-Bara’at. Muslims also pray for their deceased parents and relatives on this night, and light candles on their graves. Hazrat Ayesha reported that Prophet (Sallalaho Alaihi Wasallam) said, “On this night Allah Ta’ala give details of the names of those who are to be born the coming year and those who will die in it.” The deeds of men are taken to Him and all the provisions of man descends in it. “ Hazrat Ayesha (Radi Allahu Tala Anhu) narrated in another Hadith that the Prophet (Sallalaho Alaihi Wasallam) said, “Allah Ta’ala forgives men of my Ummah in abundance and without account on this night.” it is unanimously said that in this blessed night the whole of the Qur’an descended from Lauh-e-Mahfooz (Divine Tablet) to lower (worldy) heaven and gradually to our Prophet (Sallalaho Alaihi Wasallam) . I missed Allah’s Messenger (saws) during the night and found him in al-Baqi’. He (saws) said: Were you afraid that Allah and His Messenger would deal unjustly with you? I said: O Allah’s Messenger (saws), I thought that you had gone to some of your other wives. The Prophet(saws) said: Verily Allah, the Exalted and Glorious, comes down to the heaven of the world in the middle night of Sha’ban and forgives sins even more abundant than the hair of the goats of Kalb. If I Was Not Able 2 Prove Myself As a Good Friend Or A Good Person.. I m Sorry 4 Everything..
Plz forgive me and always remember me in your prayers. A great spiritual night is just on its way now and we will celebrate it on mid of Shabban month according to the Islamic calendar. while if we talks about the English date for Shab Barat then we will celebrate from the night of 20th April and the day of 21st April. 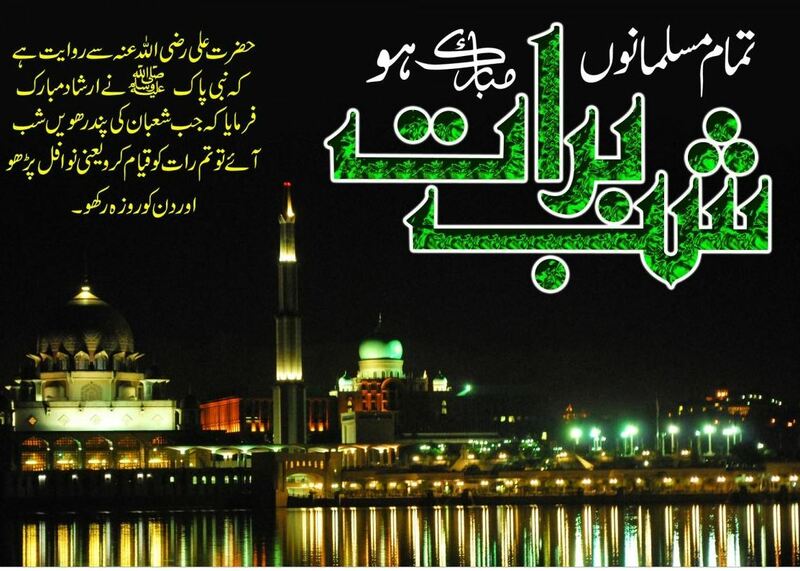 During these days and night we will send and receive some speicla Shab e Barat wishes for friends and family. In this way, here I am sharing the latest collection for you which you can share with your friends and family in the sence of Shab e Barat wishes. Aur Humari Duain Qabool Farma. Aaj Q ye Aasmaan Sajaya Jaraha hai. Lagta hai koi Mehmaan Bulaya ja Raha hai. Jannat Mein Q khari hai Sajdaj k ye Sawari. Aisa kon hai Jis k liye fizao ko mehkaya Ja Raha hai. Kis ki hai Aamad Aaj Aasmano k Sar Par. Bahot dair se Chand bhi Muskuraye ja Raha hai. Aaj Paighamber bhi Khare Saf Bandh k Intaizar e Imaam . Wo kon hai jo Paighambaro ko Namaz Parhane Aa Raha hai. Jab Pucha kisi Ne kon hai Wo Zaat Khuda Se. After Maghrib namaz, read 2 rakats of Nafil. In the first rakat, after Surah-e-Fatiha, read Surah-e-Ikhlas 3 times and Surah-e-Falaq once. In the second rakat, after Surah-e-Fatiha, read Surah-e-Ikhlas 3 times and Surah-e-Naas once. After Salaam, read Surah-e-Yaseen then Dua-e-Nisf-e-Shabaan, make Dua and ask Allah to protect your Imaan. After namaz Maghrib , read 2 rakats of Nafil. Thereafter, read Surah-e-Yaseen once, Surah-e-Ikhlas 21 times and Dua-e-Nisf-e-Shabaan once. Then, make Dua for Barakat in Rozi and ask Allah not to make you dependent on anyone. 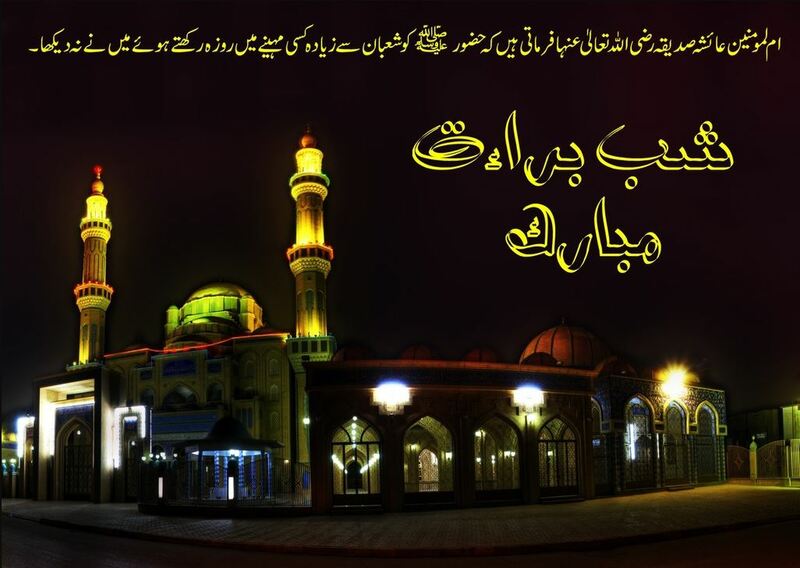 Praying 100 (Hundreds) Nafils on the Islamic night of Shab e Barat with a special technique is bound to bring forgiveness and blessings alike. In every Rakat, Surah e Fatiha should be read once, when Surah e Ikhlas should be recited 10 times. Which means for everyone Surah-e-Fatiha in a rakaat, one must recite Surah-e-Ikhlas 10 times. The person who goes through with this namaz of 100 nafils will be saved from hell-fire, blessed in the world and his sins will be pardoned by Allah Almighty.